﻿ Why do I need a Wedding Post Box for my wedding? A Wedding Post Box, Why? If you have attended a wedding reception in the recent past you may have noticed that traditions have changed over the years. With more and more couples living together and setting up home before marriage, there is generally less call for the obligatory toasters, kettles, tableware and dinner services as gifts as they are already owned leaving the traditional big gift table to be a fondly remembered thing of the past. Today it is common place and acceptable to request vouchers for a wide range of gifts and even monetary offerings. 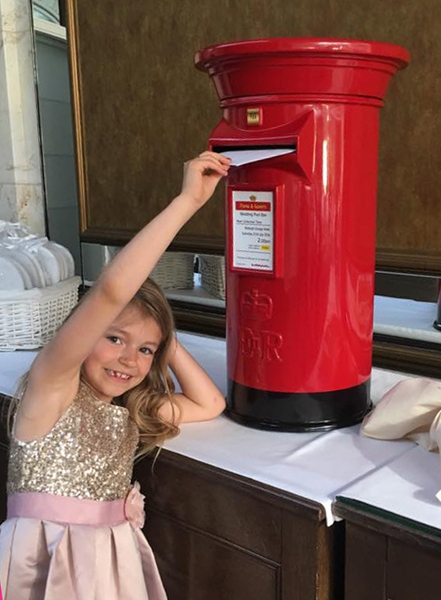 Guests clutching valuable envelopes and without an obvious place to drop them can often feel uncomfortable waiting to catch the attention of the best man, the ushers, the groom or even the bride. A fun and safe place for the guests to leave their cards and gifts is an essential addition to any wedding plans leaving your guests to relax and enjoy all of the preparations you have worked so hard on. Some may choose to decorate a cardboard box and cut a slot to accept their gifts however at previous weddings many have carried a wedding card for hours not knowing where to place it at the reception only for late in the evening to be guided to a box wrapped and decorated that could easily be mistaken for a gift left for the happy couple! When inviting close friends and relatives to your reception the last thing you may expect to happen is that any gifts may go astray. However not only are your guests present but venue staff, caterers and perhaps musicians or entertainers. Without a safe haven to store such cards and gifts they could well be vulnerable to an opportunist to quickly slip away with without anyone ever noticing. On one reported occasion where the wedding party did not have a secure post box such an incident occurred. A close friend of the bride's gift went missing and not only was the gift never recovered but the friendship was also tested as unbeknown to the friend, as the gift had not been received, there appeared no need for the couple to show their gratitude. Only some months later did it become apparent what had actually happened. So an obvious location for wedding gift items to be posted is required and the solution is a recognisable yet stunningly beautiful wedding post box in a colour to match your wedding colour scheme. And for extra peace of mind our hire post boxes are also securely lockable and small gifts, keep sakes and disposable cameras could also find haven within the post box by unlocking and placing such items inside.